ShowMan is a program to help recover disk space. It gives pie-chart view of disk usage, including unused space, with the ability to drill down into folders. Shows actual or nominal space occupied. Knows about the effects of cluster sizes. Program to help recover disk space. Gives pie-chart view of disk usage, including unused space, with the ability to drill down into folders. Shows actual or nominal space occupied. Knows about the effects of cluster sizes. If you want a piechart of your FTP space on an ISP. To see the space occupied by a folder tree, just right-click the folder in Windows Explorer, and use the Usage PieChart option (after installing the program). ShowMan is a lightweight software application whose purpose is to help you analyze disk space usage and get details about the size of each folder and document that is stored in your computer. You can copy it on any USB flash drive or other devices, and take it with you whenever you need to view the space occupied by files and folders on the breeze, without having to go through installation steps. ShowMan gives you the possibility to monitor your disk space usage with the aid of a pie chart. Plus, it offers quick access to the files and folders stored in your PC, so you can easily view the size occupied by the selected item. 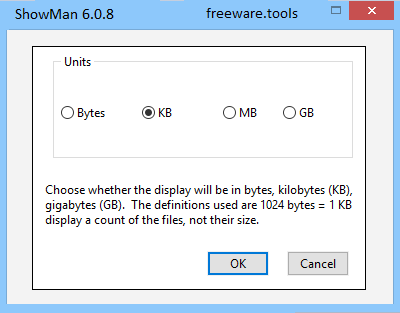 There are several configuration settings bundled in this tool designed to help you pick the measurement unit (bytes, kilobytes, megabytes, gigabytes), check the size of the compressed items, as well as add a new entry into the context menu that allows you to view the pie chart with disk usage data for the selected folder. What’s more, you can print or export the information to plain text file format, refresh the current data with just one click, show free disk space, reveal the actual or nominal occupied space, as well as automatically repeat the scanning operation at a user-defined time. Last but not least, you may customize the layout of the pie charts by selecting the preferred colors for delimitating areas, and tweak the text in terms of font, font style, color, and size. To sum things up, ShowMan seems to be the right choice in case you are looking for a simple-to-use application that comes bundled with limited features for helping you analyze disk usage. It needs a different approach for making the entire process more intuitive and powerful functions, such as filters (e.g. extension, size, creation time) and comprehensive reports, for improving its overall functionality.